Lindamade » Yum, Version 2. Tonight I whipped up this gloriousness. I got the idea for the chicken from a Kraft recipe, but modified it a lot. To start, I salted and peppered some tenderloins (as I would any meat I cook), then added some Morrocan rub from my V-day gift. That stuff is divine! Next I put it in a glass baking dish and spread some sour cream on top of each piece (yogurt would work, too). 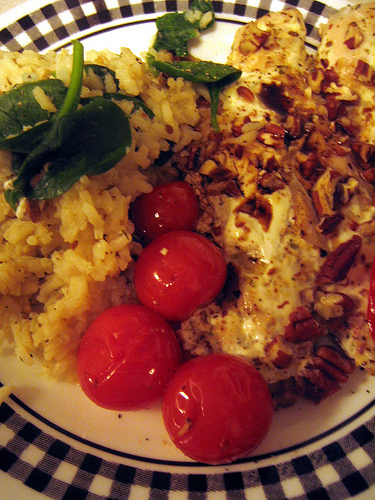 Then I chopped a bunch of pecans and sprinkled them on top, and threw some cherry tomatoes on top of the dish for a side. I cooked it at 375 for 25 minutes and it was done perfectly. I splashed the chicken with some balsamic vinegar to finish it. For the rice, I added the same spice mix to the water along with some olive oil. Now, the secret to rice is very low heat and patience. Once you put the lid on, don’t take it off! And once the rice has cooked for 15 minutes (or whatever the package says), turn off the stove but leave the lid on for another 10 minutes to really steam up. That’s what I did here, then I threw in the spinach and put the lid on again so that it wilted, and the texture was perfect. I threw it all on a plate and oh my, it was delicious!! I’m no longer hungry but I still want more. I think you could make the chicken even without the rub– a dash of cumin and sugar are the first 2 ingredients on the jar, and then everything else under the sun– parsley, chili, cinnamon, turmeric, nutmeg… you get the gist. The Kraft recipe had yogurt, mayo, mustard and almonds on top of chicken… not exactly my cup of tea, but a good starting point nonetheless. I made this once before with just yogurt, walnuts, and feta cheese- and that was good too (although a little bland). Any recipe that’s simply “spread stuff on top of meat and bake” is a winner in my book. Yum.